It has been a while since we bought some snacks from St. Anny in Rotterdam. We were in the neighbourhood scored some Chinese roasted pork at May Fung went by St. Anny’s and got these goodies. Fried Cha siu bao. We never seen or had these before. The outside is nice and crispy and the inside has the soft firm texture of my scones. 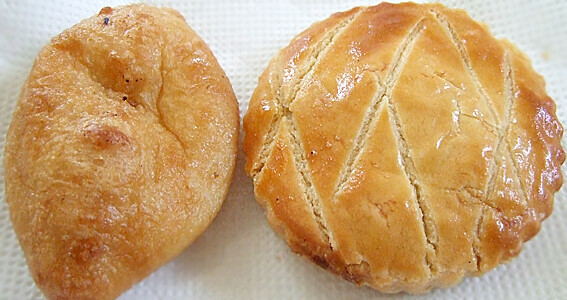 The bread seems slightly sweet which goes well with the cha siu filling. Will definitely buy these again. On the left, Ham sui kok a fried glutinous rice ball filled with meat and vegetables. I’m guessing this one only has pork. These didn’t have that much filling, but they were fine none the less. On the right is a Chinese chicken pie, it’s about the size of my index fingers and thumbs making a circle. It’s flat like a cookie, has a crumbly top (like pie crust) and a flaky puffpastry like bottom. It’s filled with a chicken, onion and corn mix. A nice little snack for when you aren’t too hungry.